Formula One team bosses have agreed on a new engine formula to be introduced in 2014 after several teams had concerns about the proposed inline 4 cylinder engines. 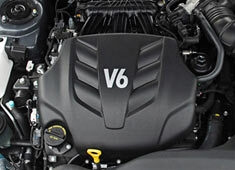 The new engine type and introduction date is a compromise that satisfies all engine manufacturers. Even though the FIA voted in favour of the 1.6l turbocharged I4 engines, it emerged in recent weeks that Ferrari were not happy at all about the new formula while Mercedes were worried about the time of introduction. Renault on the other hand made it very clear that they would consider quitting Formula One if the new engine formula would not go ahead. When Renault decided to sell its team and continue as an engine supplier, road relevance and fuel consumption reductions were one of the main reasons to get on with their running F1 programme. The BBC learned from sources within the FIA that the new formula is a compromise solution that is acceptable to all parties. Apart from its additional 2 cylinders that would make the engine sound differently and more sporty than an I4, the V6 also provides a stiffness advantage which could make it easier to maintain the engine as a fully stressed member in F1 cars. Despite the likely higher fuel consumption compared to an I4, the team bosses agreed to also introduce a fuel flow limit that will see fuel consumption reduce by 35% from current levels. Additionally, engines are set to be limited to 12,000rpm, compared to 18,000rpm right now. It is expected that together with the turbocharging, power outputs will remain largely the same at 750bhp. While not part of the 2014 engine specification, compound turbocharging is set to be introduced at a later date.